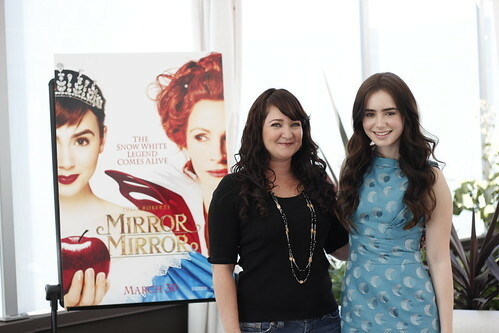 How do you prepare for meeting Mirror Mirror's Lily Collins? 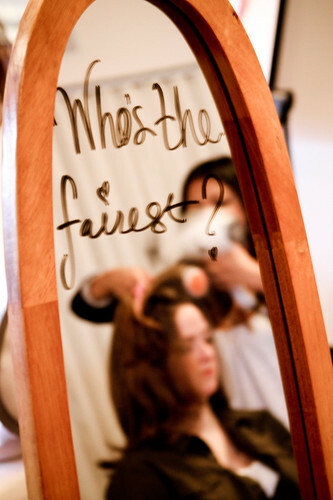 How Do You Prepare for Meeting Mirror Mirror’s Lily Collins? One of my favorite things about the film Mirror Mirror was the costumes. OH EM GEE, the costumes!! So, in keeping with the theme of beauty, other bloggers and myself were whisked away for a morning of mimosas, manicures, make up sessions and beauty treatments fit for a princess! 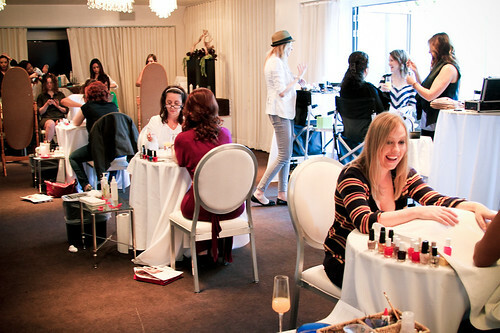 Lolli also took this fabulous photo of the manicures and beauty treatments that morning. Doesn’t everyone look happy? It can be intimidating to meet a lovely actress like Lily Collins, especially after watching her play the iconic role of Snow White in Mirror Mirror. The good people at Relativity Media were kind enough to set up this wonderful morning of beauty for us to help us look and feel our best before sitting down with Lily Collins for a round table interview session. I loved these nail polish colors! We were given quite a few different colors to choose from, and I ended up choosing China Glaze’s “Ruby Pumps” which is a deep, sparkling red. I love it! 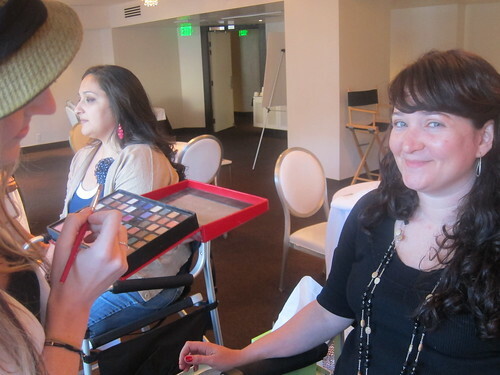 After getting my manicure, I sat down for my make up session. I’ve never had my make up done professionally before and I was nervous and excited to see what my make up artist did to me! The way we were situated, I could see my friend’s reflection in the mirror, but I couldn’t see myself. She could see me, but not herself. It made for a very nice surprise after my make up was done! I headed outside to pose in the garden for a little photo! And then, of course, I had to pose with the huge poster of Lily Collins as Snow White. How could I not? As we waited for Lily Collins to arrive for our round table interview sessions, I browsed through the recent magazines in which Lily Collins has appeared to familiarize myself a little more with her personality and to get a feel for what she would be like. I love the air of confidence she exudes in her interviews! She is such a bright and lovely young lady, and that really comes across in her interviews! That make up session really paid off! I want to say a special thank you to Relativity Media for all of their hard work in putting together our morning of beauty. Between the hair stylists, make up artists and manicurists, we all really felt like princesses and felt confident in sitting with the lovely Lily Collins. 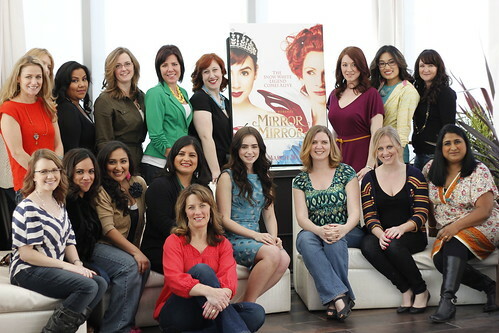 Mirror Mirror will be released in theaters on March 30th and this is one film you do not want to miss! You can ‘Like’ Mirror Mirror on Facebook and visit the official website to watch the trailer & grab free downloads! You can also follow Mirror Mirror on Pinterest for behind the scenes photos and more! So proud of you Jenn!!!!!!! So very fun!!!! The pampering, the meeting her, seeing the movie, everything! What a great experience, not just for you but for her too! Congratulations on increasing her exposure with this really good post!! I’m so completely jealous but you totally deserved it! &You looked gorgeous as always! Can’t wait to see this movie!